Volcano Facts for Kids – Fun Volcano Information for Children. Facts on Volcanic Eruptions, How volcanoes Erupt and lots of other volcano questions. Volcanoes are openings in the Earth’s surface. A volcano is a landform (usually a mountain) where molten rock erupts through the surface of the planet. Volcanoes are formed when magma from within the Earth’s upper mantle works its way to the surface. At the surface, it erupts to form lava flows and ash deposits. Over time as the volcano continues to erupt, it will get bigger and bigger. What are the different types of volcanoes? Volcanoes are grouped into four types: cinder cones, composite volcanoes, shield volcanoes and lava volcanoes. Cinder cones are circular or oval cones made up of small fragments of lava from a single vent that have been blown into the air, cooled and fallen around the vent. Composite Volcanoes – Composite volcanoes are steep-sided volcanoes composed of many layers of volcanic rocks, usually made from lava, ash and rock debris. Mount St. Helen is this type of volcano. Shield Volcanoes – Shield volcanoes are volcanoes shaped like a bowl or shield in the middle with long gentle slopes made by basaltic lava flows. Lava Volcanoes – Lava domes are formed when erupting lava is too thick to flow and makes a steep-sided mound as the lava piles up near the volcanic vent. What are the three layers the Earth is made of? The crust is the outer layer of Earth. It is about 18 miles thick. It is the part we live on. The second layer is called the mantle. It is about 1,800 miles thick. The inner layer is called the core. What are the different stages of volcanoes? Three main categories: active, dormant, and extinct. An active volcano is one which has recently erupted and there is a possibility that it may erupt soon. A dormant volcano is one which has not erupted in a long time but there is a possibility it can erupt in the future. An extinct volcano is one which has erupted thousands of years ago and there’s no possibility of eruption. What causes volcanoes to erupt? The Earth’s crust is made up of huge slabs called plates, which fit together like a jigsaw puzzle. These plates sometimes move. Between the Earth’s crust and the mantle is a substance called magma which is made of rock and gases. When two plates collide, one section slides on top of the other, the one beneath is pushed down. Magma is squeezed up between two plates. What happens in a eruption? Eruptions can cause lateral blasts, lava flows, hot ash flows, mudslides, avalanches, falling ash and floods. Volcano eruptions have been known to knock down entire forests. An erupting volcano can trigger tsunamis, flash floods, earthquakes, mudflows and rockfalls. When magma erupts, what is it called? 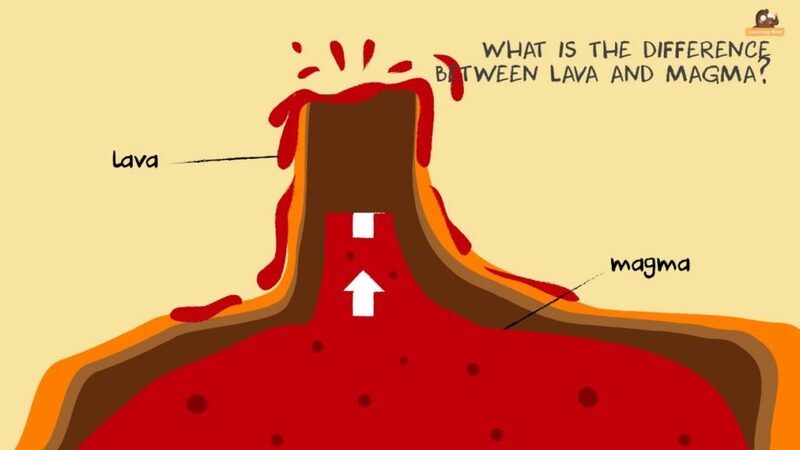 What is the difference between lava and Magma? Magma is liquid rock inside a volcano. Lava is liquid rock (magma) that flows out of a volcano. Fresh lava ranges from 1,300° to 2,200° F (700° to 1,200° C) in temperature and glows red hot to white hot as it flows. How many volcanoes are there in the world? There are around 1,510 active volcanoes in the world. We currently know of 80 or more which are under the oceans. What is the largest active volcano? The world’s largest, active volcano is Mauna Loa in Hawaii, where famous coffee is grown in the rich volcanic soils. Mauna Loa is 13,677 feet above sea level. From its base below sea level to its summit, Mauna Loa is taller than Mount Everest. The word volcano originally comes from the name of the Roman god of fire, Vulcan. MAGMA – Magma is the liquid rock inside a volcano. LAVA – Lava is the liquid rock (magma) that flows out of a volcano. Lava glows red hot to white hot as it flows. ACTIVE VOLCANO – An active volcano is one that erupts regularly. DORMANT VOLCANO – A dormant volcano is one that has not erupted for many years, although there is still some activity deep inside. EXTINCT VOLCANO – An extinct volcano is a volcano that is no longer active. GEYSERS – Geysers are springs that throw boiling water high in the air. They are caused by volcanic heat warming trapped ground water. ASH – Ash are very small fragments of lava or rock blasted into the air by volcanic explosions. PUMICE – It is a light-colored volcanic rock containing lots of bubbles from trapped gases. Volcano Facts for Kids - Fun Volcano Video for Kids-Information about Volcanoes-Facts and Causes Learn about: Information about volcanoes, volcanoes, volcano eruption, what is a volcano?, volcano definition, what causes a volcano?, shield volcano facts, causes or volcanoes, how volcanoes formVolcano Facts for Kids - Fun Volcano Information for Children. Facts on Volcanic Eruptions, How volcanoes Erupt and lots of other volcano questions. How are volcanoes formed?